Old buildings have been going down like nine pins in the East End recently. They are the latest sad additions to a catalogue of loss that stretches back over more than a century, inducing sufficient grief among the populace to fill the Thames with tears. Yet it is not our nature to be defeated and, upon each occasion, there have been those who have stood up and objected. Many of the most-loved old buildings that survive today owe their existence to such brave souls. Until now, small groups of people have come together to save a particular building – but the accelerating sequence of losses in recent years, combined with some monstrous developments looming in the immediate future and the failure of the public consultation process, calls for collective action. Thus I write today to conjure into existence The East End Preservation Society as a means to bring together everyone that cares about the East End and is concerned about the future of its built environment. If we can work collectively in large numbers, we can have a stronger influence upon the culture of development that threatens old buildings and be more powerful in our individual campaigns to save them. Less than a month ago, Mayor of London, Boris Johnson gave his approval to a plan that reduces the venerable structure of the Queen Elizabeth Hospital for Children in Hackney, which represents a noble history of philanthropic service, to a mere facade upon an overblown commercial housing development of questionable quality. A year ago, the Mayor of London overruled a unanimous vote by the elected members of Tower Hamlets Council to save the Spitalfields Fruit & Wool Exchange, and gave developers licence to replace the building with an office block and shopping mall of generic design, upon which the stone facade of the current building will sit as a painful reminder of the distinctive edifice that once stood there. 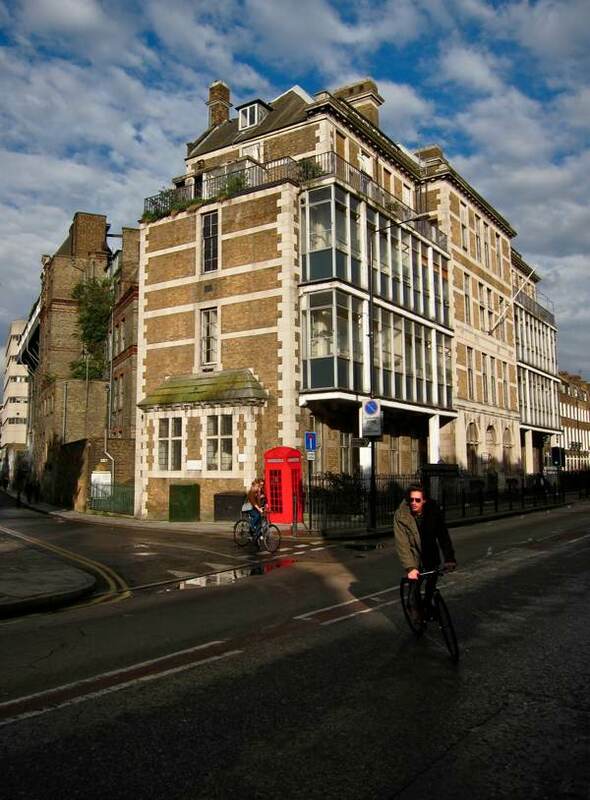 In this climate, where democratic decision-making is being undermined and public consultation reduced to a cynical public relations exercise, the rescue of The Marquis of Lansdowne from intended demolition by the Geffrye Museum was a joyful exception to the rule, proving that strength of public feeling can still be successful in saving an old building. So I ask you to come to the Main Hall at the Bishopsgate Institute on Wednesday 27th November at 6:30pm for the launch of The East End Preservation Society. Spitalfields resident, writer and campaigner, Dan Cruickshank has been invited to address the assembly. We will be showing images of notable buildings that have been lost and buildings that have been saved in the past. Will Palin, ex-secretary of Save Britain’s Heritage, will be assessing the recent history of destruction and introduce reports upon current developments at the Bishopsgate Goodsyard and in Whitechapel that threaten the East End. Most importantly, we shall be suggesting ways that you can get involved and proposing how we can become organised to make an effective response to the current crisis. If the future of the East End is important to you, you need to be there. 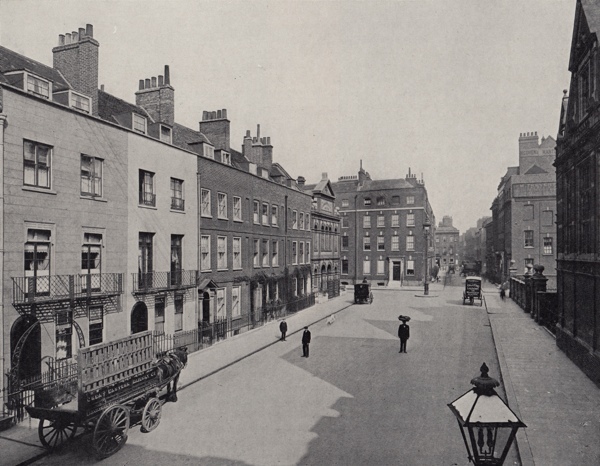 Spital Sq – Within living memory, this was one of London’s most beautiful squares but it was sacrificed to road widening and commercial developments at the end of the last century, and only one eighteenth century house survives today. The Jewish Maternity Hospital in Underwood Rd was designed by John Myers in 1911. This Arts & Crafts style cottage with its elegant crow-stepped gables was reminiscent of a streetscape by Vermeer and, athough it had lost its diamond-paned leaded windows, it retained its original doors and ironwork. 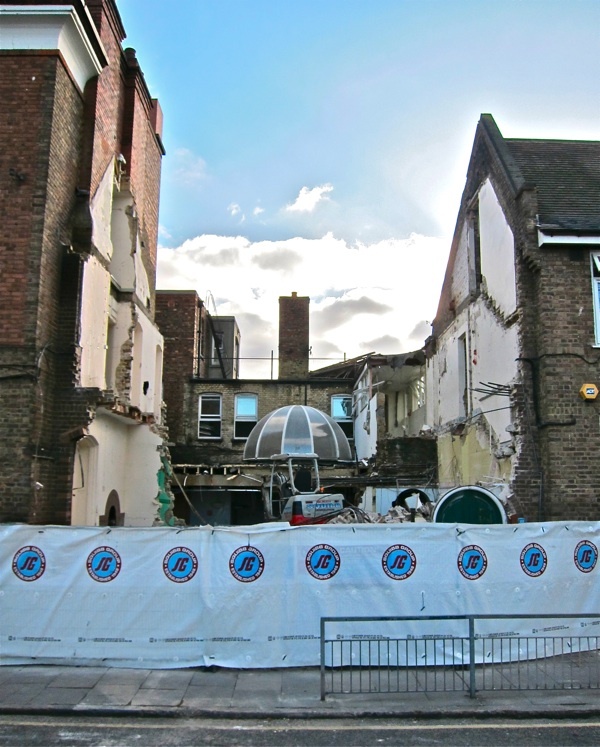 In January 2012, this is what became of the nursing home where Alma Cogan, Lionel Bart, Arnold Wesker and many thousands of Jewish East Enders were born. Next year, this stone facade is all that will remain of Sydney Perk’s 1927 Spitalfields Fruit & Wool Exchange when the new office block and shopping mall are constructed behind it. Magnificent staircases at the Fruit & Wool Exchange will be trashed in the forthcoming demolition. Only the facade of the Queen Elizabeth Children’s Hospital on the Hackney Rd will survive if the current plan goes ahead. The oldest part of the Queen Elizabeth Children’s Hospital in Goldsmith’s Row is slated for demolition. 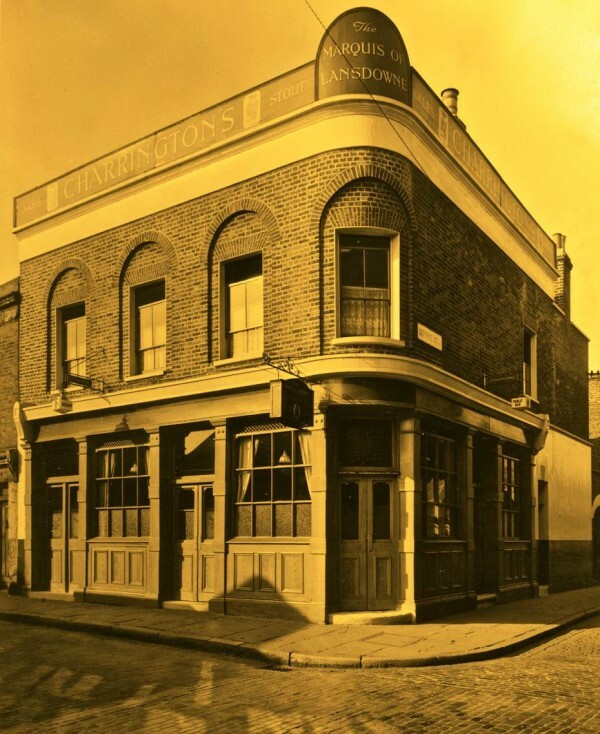 After Hackney Council refused permission for demolition in response to a public campaign, The Marquis of Lansdowne is to be restored as an integral part of the Geffrye Museum’s proposed new extension. I wish the East End Preservation Society much success. I shall be thinking of you. Excellent idea, I’ll be there! The monstrous Bishopsgate Goods yard has to be first in the sights? Cannot agree with the spirit of this more strongly – when I think of all the ancient buildings which survived Great Fire and Blitz but then vanished within the last 30 years I could weep. Wonder what Boris Johnson sees when he looks in the mirror? A citizens revolt to protect our beloved city. Only by standing and fighting together can East Londoners (and Londoners as a whole) force a revision of the ‘London Plan’ and protect our city for future generations. This legislation has not only further removed Londoners from the big decisions that affect their daily lives and communities, it has also further removed the local authorities from these big decisions too! It now appears it represent the Mayor’s friends in big business property development rather more than local communities. 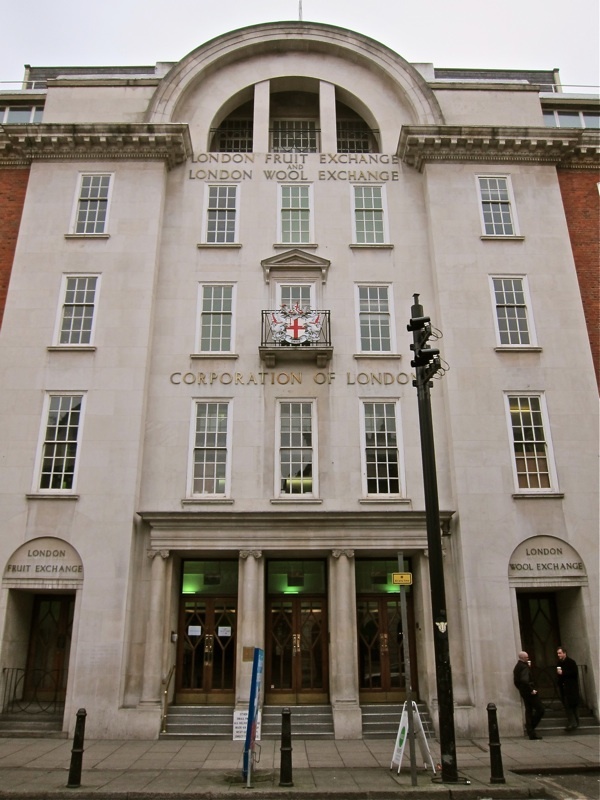 Unless the active citizens of London unite and fight we will see historic building after historic building fall as the unique identity of each London borough loses its distinctness to morph into one bland, soulless entity populated by passive consumers and insouciant bystanders. After your launch, please let the public know how they can rally behind you. Over 40 years of visiting London from Australia have filled me with dread at the next batch of ‘developments’ looming on the East, as well as West, North and South London horizons. Surely there are enough Britons sharing your dismay and with enough influence in high places to get some of these de-humanising projects repealed? Think of the saviour of St Pancras Station and gird your loins! I would very much like to be a part of this, a good initiative with so much re-development proposed in the future and with what little that has been left behind after the 2nd World War and subsequently. the east end is becoming the new creative center of London in may ways…and the most manifest will be in our new built heritage. This will last for many years, and hopefully if really good, well beyond our own lives. Put simply – Imaginative redevelopment should be and is proven to be possible, it requires understanding, appreciation and skill. What amazing news that you have the passion to stand up against the over development of such a wonderful/creative area such as the EastEnd. Do we want another Canary Wharf on our doorstep in Shoreditch – 7 Skyscraper… NO! Thankyou and its in our diary to attend……! Yes indeed. What an excellent idea! The skyline menaces, while charm and character is replaced, the presence of history erased. This is our home and city. Great idea to get this going. Badly needed. Good luck to you, wish I could be there, but am 3000 + miles away. I was born at the Jewish Maternity Hospital in 1934, but I think that this is the first time that I have actually seen what the place looks like. I also visited the Queen Elizabeth Hospital many times, even having my tonsils taken out there not long before the war began. Progress is not always something new and bright and shiny. Think of how fantastic the Fruit and Wool Exchange could be, staircases and all. How sad. Will be there, I hope. I’ll keep checking for further developments and ways in which I might be able to help. Our East End heritage is disappearing at a rate of knots and we desperately need to do something about it. Good luck with the launch, looking forward to reading your report of the evening’s events! Fantastic idea : time to give a voice to our heritage and for the people to be heard – lets try to retain some of the last vestiges of old london, the bricks & mortar our ancestors built, lived and died amidst. See you there! Within my twenty years in Spitalfields I along with so many who have loved and cherished this ancient neighbourhood have seen so much lost and even today the new gleaming city of glass and it’s immense wealth seems to be a looming threat to the ancient fabric of our glorious neighbourhood and this part of London. Without the past we do not exist and the beauty of these buildings remain to give a human scale that we live amongst. It’s up to us to save this for the future generations that will come after us. Count on me as a long distance supporter. Fantastic news! Will definitely be there. I was at the Bishopsgate Institute for Dan Cruickshank’s lecture back in the spring, so do hope he’s going to be actively involved! Will definitely be supporting this! Launch date is in the diary. Fantastic idea. Would love to be kept updated as to how we can help. Although I was born in Australia, I can trace ancestors from both my mother AND my father back to East London as far back as the 1700′s. In the last few years I have come to know Poplar,Limehouse,Mile End,Whitechapel,Shoreditch and the Spitalfields .Often I wish I could go back in a time-machine to visit those streets that my ancestors lived in because most of them are no longer what they were or do not even exist. I live in Switzerland so can not be there at the meeting but I will sign any petition at any time to save those East End buildings. They are precious and far too under-appreciated. Something to be a part of and being a member of JEECS (Jewish East End Celebration Society) I know how important this is! As I am no longer on Twitter, will there be a Facebook page or an actual membership to subscribe to? Congratulations on getting a rethink. And The Geffrye and architects should also be congratulated on rethinking – shame they couldn’t have taken community feeling into account in the first place but at least they got there in the end. So many other developers never do. I do believe there is a Motion going before the Full Tower Hamlets Council to halt the demolition & change or use of Public Houses in the Borough, at last. I will be away on Wednesday, but with you in spirit. Please keep me informed of activity. I am very local to the Queen Elizabeth and protested against its proposed (now approved) ill-designed, ill-considered redevelopment that is simply unkind to the local community and location. Perhaps you could also celebrate what has been saved in the East End. Virtually the whole of the Mercers Estate in Stepney is intact largely due to the vigorous squatters movement of the nineteen seventies which occupied it and campaigned against demolition. As a result, York Square and the streets off it, much of Salmon Lane, Whitehorse Road, Bromley Street, Aston Street, Belgrave St and Chudleigh St still exist as do the Alms Houses on Stepney High Street. There are also about twenty mid Victorian terraced house on either side of Jubilee Street, the top end, as well the tenements in Lindley St and Grove dwellings off Adelina Grove. 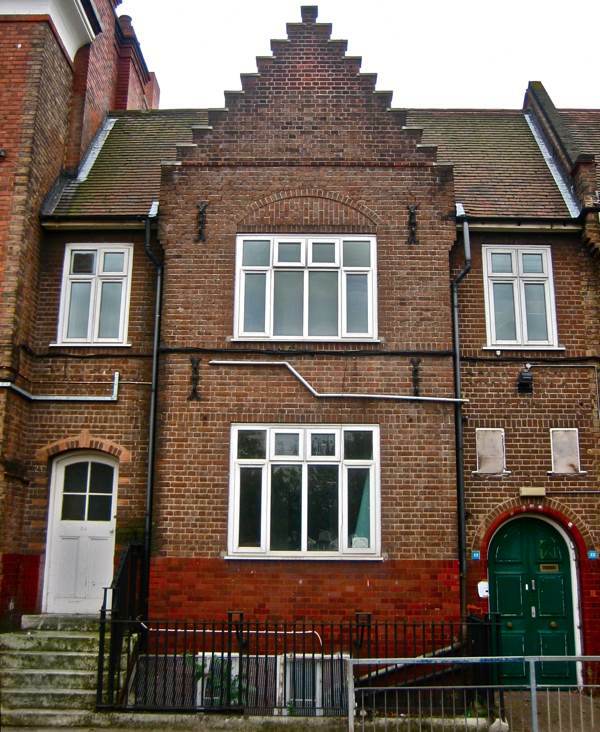 Further towards the City are the wonderfully preserved Fieldgate Mansion on Fieldgate Street with the street running south from them to Commercial Road. In all several hundred buildings of architectural interest that were saved by a radical social movement that is scarcely mentioned these days. I am particularly proud of drafting the objections to the GLC demolition of Bromley St to make an enlarged car park for the Ford dealers on Commercial Road and it is one of the longest preserved Victorian streets in London. I wish we could have kept Pelham Buildings in Woodseer Street home to myself and three hundred Bangladeshi squatters for over two years but it had deteriorated to such an extent that it couldn’t be saved. That saga is highlighted in the last programme in The Secret History of Our Streets series about Arnold Circus the whole series of which is up for a documentary award in Radio Times. 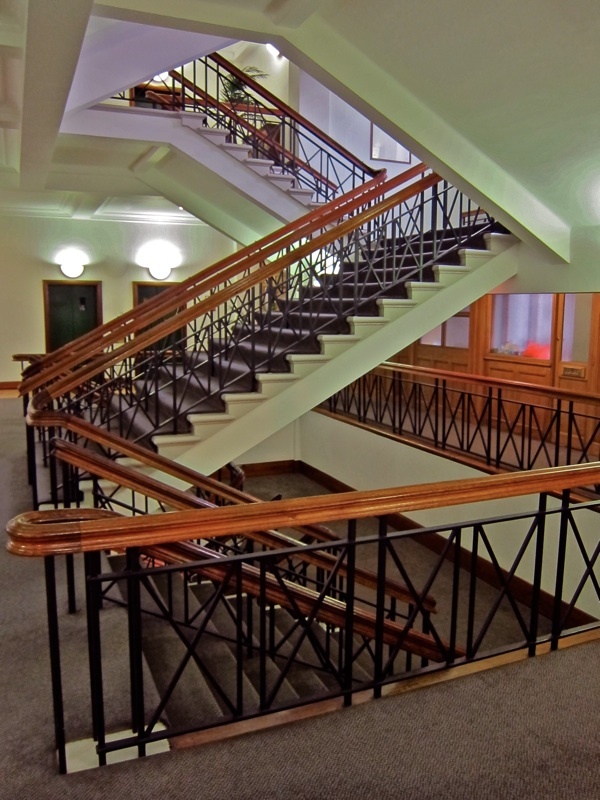 Pelham had originally been called Schwartz Buildings and had been almost entire Jewish and when we left we also left four upright pianos which we couldn’t get down the stairs. They had apparently been hauled up on blocks and tackles and taken in through the windows the frames of which had been removed. If it’s going to be an East End Preservation Society then there is a lot of history and a lot of buildings outside Spitalfields to look at. How do I get involved? Seems i missed the launch on Wednesday but I’d love to help out. I’ve had my eye on a few run down historic buildings in the borough – maybe we can club together to try to save them in near-original form? For example, 777 Commercial Road is beautiful but about to fall in. It would be such a shame, and it could easily be re-purposed. The Tower Hamlets council’s buildings at risk register is a treasure trove of historic buildings which could be rescued given enough effort. good luck, and let me know how I can join! I was appalled last time I travelled from Liverpool Street and walked around the area. What are the planners thinking of? Money, money money? Good luck, even if I cannot be on the ground marching. I live on the Isle of Arran! The article in The Guardian reminded me how we must all be vigilant! A very worthy cause !!! Good luck !!! East End born and bred but now live an ocean away. Each time I visit something else remembered from my childhood (especially my old school, Spital Square) is gone. So good luck in your very worthy endeavor. Do you know I’ve been searching for a few (maybe a couple then) of decades now for news of Pelham Buildings – the very mention of its name escaped me, even though I’ve visited this site more than a few times. Nowadays, I live in North Devon but on Friday of last week I had reason to visit the London for the first time in the 61 years since my birth and the area for the first time since the last Batham/Davies/Morris/Bailey died out some 30 years ago. My mobility isn’t so good but I managed to visit the old addresses – Old Ford Road, Brady Street, Vallance Road – and those of granddad’s pubs that are still standing. I was, apparently, taken around each of the neighbourhood pubs as a newborn for half-a-crown to wet the baby’s ‘ed as my granddad, Reg Davies, was a well known punter in each. So yesterday I went home. I mean home home, to the East End. And I missed my mum and dad so bad because I was surrounded by their stories. 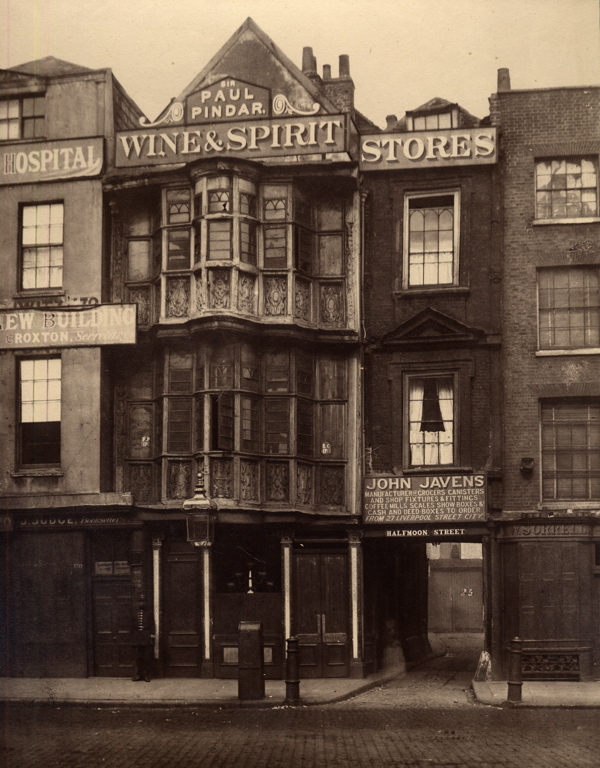 I spent my first 5 years just off Brick Lane in Whitechapel, having been born at the London Hospital. No Royal in those days. No, just a run down cockney hospital populated by run down cockney people. It did good for itself, became a world leader but beneath it’s posh new facade it’s kept the old arches and steps on Whitechapel High Street, to remind itself of its beginnings. My mum sat on those steps when she reached term because she was terrified of going into labour and having me at home alone. Perhaps it was these stories that made me the midwife I became. Beneath my well-educated, intelligent persona, you will find the poor scared little cockney girl. Just like the hospital in which I was born, scratch the surface and you will find our roots. And yesterday, as never before, I was reminded of them and I am oh so proud of them. HOLDING HANDS TODAY at 3 ‘o’ Clock ! to know of the DESTRUCTION that is happening to our wonderful Historic City. able to HOLD HANDS around the Precaious Peremiter can bring about some SUCCESS. GOOD ON YOU ALL – If I had Not Been Ill, I TOO would have been there. I too would like to lend my name to anyone who can stop this destruction. 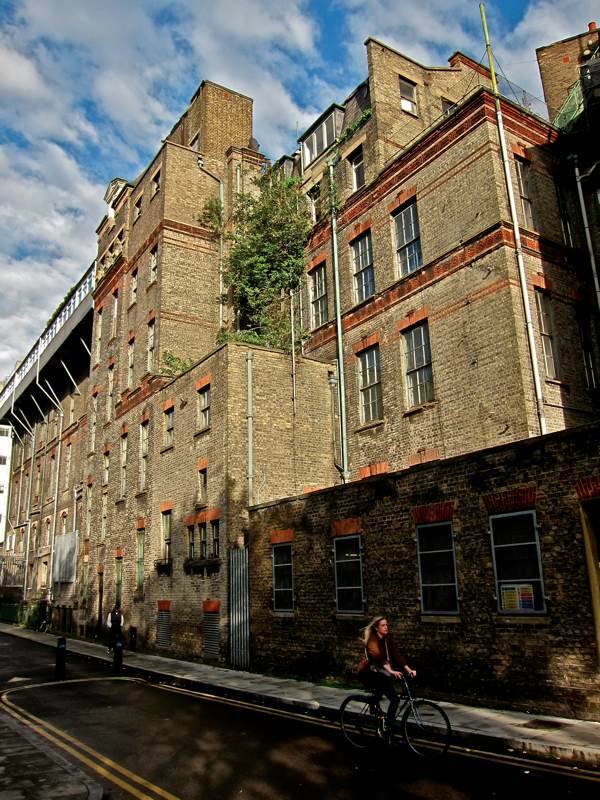 I read today that Tracy emin wants to pull an old mill down and put a souless modern studio in its place.my mother was born in Lambeth and my father in Craven Street,W1. I read The Gentle Author’s blog every day and would love to visit the area but not really strong enough at the moment. Let us hope that common sense prevails and we can restore this area. If I can help by signing a petition or write a letter I will. Goog luck to you all. those owned by the famous. on and create, but not by OBLITERATING ALL OUR PAST.